I had a dream last night that we owned three huge red setters. They were enormous, much bigger than real dogs. Any time we tried to make food in the kitchen, they would circle around and wag their tails and the wagging would sweep all the food to the floor, and the floor of our kitchen was covered in broken crockery and we didn't care because we had these beautiful dogs. 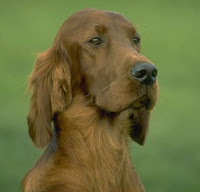 I've always loved red setters. I love the red and white ones too and, yes, even teh setters of teh oppressor. I don't know what it is, but they've always been the dog I've wanted to own. Some day I will have one, but they seem to have completely fallen out of fashion (maybe the breeders are more responsible than other breeders, or maybe it's just because they have such a reputation for being kind of crazy and destructive, although very sweet) and they don't even show up in rescue. Which is good in one way, but in another way, it means I would have to buy one in order to fulfil my dream of owning one, and I just am not someone who buys dogs. Perhaps, as usual, I am overthinking this.